Updated Norhill bungalow with great curb appeal and wonderful outdoor living spaces. 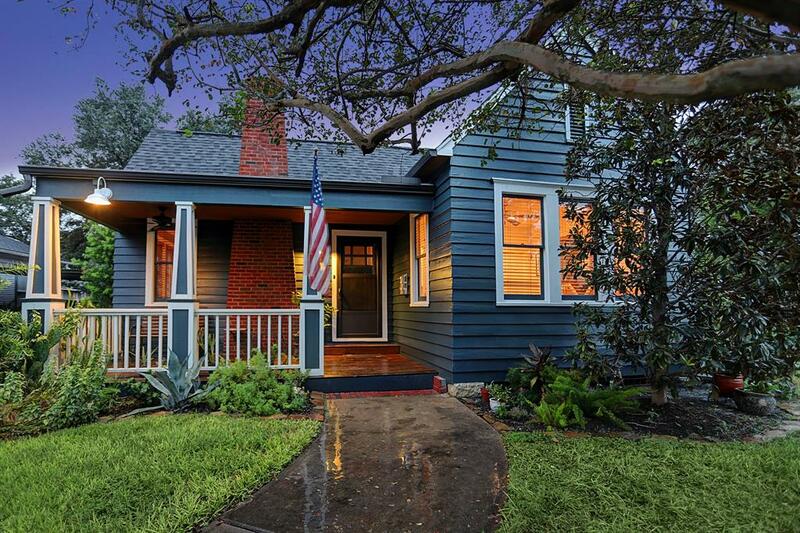 Brilliantly updated 1920 Norhill bungalow featured on Heights home tour. Beautiful landscaping, mature trees (including orange trees! ), brick chimney, & attractive front porch with reclaimed wood all contribute to the charming & inviting curb appeal for this lovely home. Custom upgraded kitchen boasts walk-in pantry, SS appliances, apron sink, subway tile backsplash, & granite counters. Entertaining flows easily between the dining room & outside living areas. Owner’s bedroom is equipped with two closets. Sublime outdoor living spaces with side and back decks and ample fenced greenspace front and back. The latest updates include freshly painted exterior (2018) and new insulation (2017), plus recent roof (2014), A/C, and garage doors for the home’s attached oversized 2-car garage. Location places you near area favorites like Teotihuacan, Pinkerton’s, and Morningstar, as well as all the restaurants and cafes around 11th and Studewood. Updated electrical (2010) and plumbing (2011). Click bit.ly/1001WGardner for more info. PENDING in the Heights! 731 Tulane Offered at $765,000.